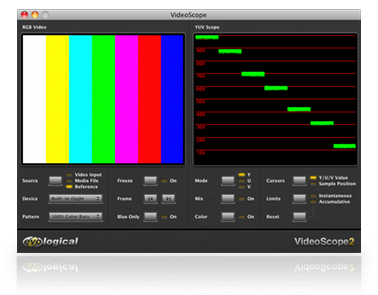 VideoScope for Mac is a software waveform and vectorscope for realtime luminance and chrominance analysis of any video source or media file. You can use VideoScope for Mac as part of your video workflow or as part of your quality control to ensure your media has the correct levels. Mix feature overlays waveform over source video. Color feature displays waveform using color from source video. Limits feature shows minimum and maximum Y/U/V values. What's New in VideoScope for Mac? Qweas is providing links to VideoScope for Mac 2.0.1 as a courtesy, and makes no representations regarding VideoScope for Mac or any other applications or any information related thereto. Any questions, complaints or claims regarding this application VideoScope for Mac 2.0.1 must be directed to the appropriate software vendor. You may click the publisher link of VideoScope for Mac on the top of this page to get more details about the vendor.